1. What is your turnaround time? We promise to ship your order the same day if we receive it by noon our time. We are on the East Coast. Of course, this assumes that we encounter no problems with your file. If we receive your file after noon but before 3:00, we can still ship it but there is a 25% rush charge. After 3:00, give us a call! We can usually still ship your research poster, but we will need the file immediately and we should coordinate over the phone. 2. What's the best way to get you my file? Enter your order using our online system. Be sure to fill out the form completely. There's nothing worse than having an incomplete ship-to address for an order that we must ship in a hurry! If you have any trouble, give us a call. 3. How big should my scientific poster be? The conference will tell you the size of the space they will give you. That doesn't necessarily mean that your poster needs to be the maximum size. Many conferences give you a 48x96" space, and a 42x90" poster works fine. We make plenty of 36x60" and 36x72" posters that are displayed on 48x96" boards. Our suggestion is to start with a larger template, and if you have a lot of empty space, copy and paste everything into a smaller one. If the conference wants a poster of a specific size, you should accommodate. 4. To what size should I set up my file? If you are designing from scratch, it's always best to set things up in actual size. If you have already set up your scientific poster, we can print to any proportional size. Since PowerPoint will not set things up larger than 56", use half size for posters larger than that. For instance, if you need a 36x60" poster, set it up as 18x30 and we will double it with our printer driver. Our PowerPoint templates are set up at half size for everything larger than 48x48". 5. What if my research poster needs to be free standing? We can create a tri-fold poster mounted on foamcore board, or you can attach a 36x48" laminated poster to a tri-fold cardboard display. 6. Which version of PowerPoint am I using? We find it easiest to tell which version of PowerPoint you are using by looking at the ikon at the upper left of the PowerPoint window. This table shows you the ikons associated with the different versions of PC PowerPoint. On the Mac, click on PowerPoint on the top left and it will tell you the version being used. 7. How big do my bitmaps (pictures) need to be? 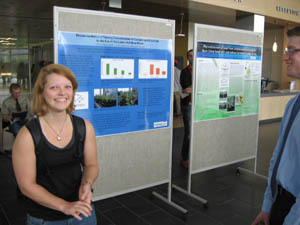 For scientific poster sessions, we like to see images between 72 and 100 dpi in their final size. That translates to a .jpg file size of around 250k per square foot of final image size. A 2 megapixel digital picture is 1200x1600 pixels and about a half a megabyte on your hard drive. This becomes a 12x16" picture at 100 dpi. Modern digital cameras will take much larger pictures, but unless they are going to be very large on your poster, more than 2 megapixel images are unnecessary. We recommend the following visual test to ensure high quality science posters. Look at your pictures at 100% (200% if we will print them at 200%). If they are pixelated (you see noticeable squares of color) on your screen, they will be pixelated in the final poster print as well. If this is the case, you will want to get higher resolution photos. scan at 150 dpi. scan at 400 dpi. scan at 600 dpi. scan at 216 dpi. scan at 576 dpi. scan at 864 dpi. scan at 108 dpi. scan at 288 dpi. scan at 432 dpi. 8. What file format should I use for pictures? PowerPoint® works best with jpg, tif, and png images. PICT and EPS images from a Mac brought into a PC are a definite problem! 9. How do I bring charts, tables, and pictures into PowerPoint? It works best to do insert-picture-from file for your photos. Charts can be copy-pasted in from Excel®, but you must be very careful that it looks OK on the screen. Sometimes it will work better to paste special as a Microsoft Office Excel Chart Object. Tables that come in funny, or look bad when you try to resize them, can often be fixed by re-pasting them using paste special and choosing enhanced metafile. Many programs other than Excel do not copy and paste cleanly into PowerPoint. If that happens, export as a tif, jpg, png, or wmf and then insert into PowerPoint using insert-picture-from file. If you are using Prism®, it is important to save your charts and graphs as a high resolution jpg, and then do insert-picture-from file. 10. Must I use the template as it is? Not at all! We simply provide them as a starting point for you. Put in all the charts and pictures you want, change the headings, color scheme, anything! If your institution has a template, or a friend has a poster file you can modify, that's fine with us. Browse our library of PowerPoint Poster Templates. If you need help with poster layout, we also offer design services for scientific posters. 11. Things don't look right when I go between versions of PowerPoint, what's going on? PowerPoint is not terribly faithful between versions, especially Mac to PC and ppt to pptx. If you and your collaborators can't use the same version of PowerPoint, and stay all Mac or all PC, we suggest that one person do the layout work and send pdf files to the others for proofing. Particulary troublesome is saving newer pptx files as the older .ppt file type- PLEASE save them as pptx. We will run your file from the version of PowerPoint you tell us you used, so if you are going between versions or platforms, proof carefully and tell us the version you used when you proofed. We have more suggestions for collaborating here. PowerPoint 2007-2106 have very good pdf makers, do File> Save As>Adobe pdf choice. One limitation of having a pdf is that we cannot then fix anything, so we honestly prefer the PowerPoint file. It's easiest to tell which version of PowerPoint you are using by looking at the ikon at the upper left on the screen. 12. Should I have my poster laminated? Lamination dresses up your poster, and the gloss lamination gives it the "wet" look of a glossy photo. We recommend lamination if you plan to use your poster more than once, or if you plan to hang it in your lab after the postersession. If you are going to use it for a few hours and then throw it away, a paper poster will usually be just fine. Matte laminate is best if you think you will have trouble with glare. Lamination also helps protect your poster from fading. You can write on the glossy lamination with either a wet or dry erase marker. 13. What's the difference between your matte and glossy papers? Our standard paper has a matte finish, much like that of regular copier paper. Glossy paper will have the "wet" look of a glossy photograph. Both will accurately render your colors and photos, and both are premium grade heavyweight papers, about twice the thickness of copier paper. 14. What can I do if I want to put my poster in my luggage? Our foldable fabric will do it! It doesn't crease, so it comes out of your luggage almost flat, and will give you a nice presentation without the hassle of carrying a big tube on the airplane. 15. Can I have my poster sent to me at the conference? Sure. Usually we send to you as a guest at your hotel. We'll need the ship-to address and phone number of the hotel. Fedex priority will get it there by noon usually, and sometimes it takes a while for the hotel to get it into their system. The front desk will be able to help you. 16. How do I arrange for payment? We prefer to charge a credit card. We can take a PO from most institutions, but many do not like to issue a PO for a small amount, and it can be a hassle. Many researchers put the charges on their credit card and are re-imbursed, or charge to a departmental purchasing card. We also take PayPal. We will send you a receipt with your order, and we can email one to you. If you pay by PO, we need a copy of the PO faxed to us at 603-536-1411. 17. How will I know you received my file? Our online ordering system will send a verification email when you complete your order. If you don't get your verification email, please call us. We will confirm that your order is being processed with a second email. It will generally take us a few hours to get your file into production. If we have problems with your file, or need information, we will email or call you. If everything goes fine, you will see an email notification of shipment from Fedex that gives your tracking number. 18. What size type do I need to use? We recommend at least 24 point type in your text boxes. If we are going to print the poster at 200%, then use 12 point type and it will become 24 point when we print it. Larger type should be used for the title and category headings. The type sizes in our templates have stood the test of time, and we suggest you start with them. 72 point type is 1" high. 19. Will you send me a proof? Our process will faithfully reproduce what you see on your screen. We can send you a pdf of what we see, there's a check box on the online order form to request that. But, a proof is normally not required, and it can delay your order. We ask that you do your proof reading before you send us a file. 20. Can you print fluorescent stain photos successfully? Yes! We use a special paper that gives very nice contrast with fluorescent stains. Either of our laminates will look good. The foldable fabric gives identical results to our paper. 21. Will my information remain confidential? Absolutely. All files are secure and will remain confidential. We do archive all the files people send us (you would be amazed how often people need a copy of their file a few years later), but if you ask us to delete the file we will be happy to do so, just say so in the special instructions. 22. Can I use a program other than PowerPoint®? Yes! We support most of the common PC and Mac design programs, including Adobe InDesign®, QuarkXpress®, Adobe Illustrator®, CorelDraw®, and Photoshop®. You can send us a pdf generated by almost any program. When making a pdf, make the highest quality pdf it will let you make. Contact us at sales@megaprint.com or call us on 800-590-7850.